FADA goes for gold in this post's celebration of competition in art. 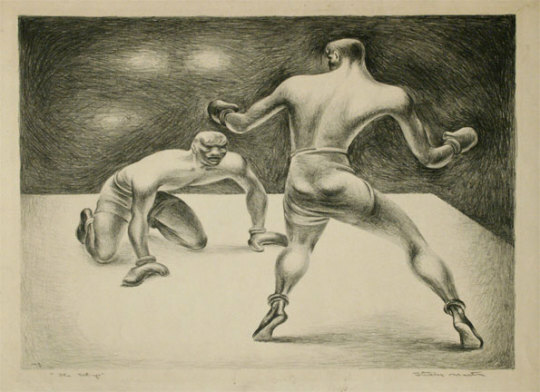 Fletcher Martin, The Set Up, c.1937-38, Lithograph, David Cook Fine Art. Click to inquire. The Olympics are upon us: a constant reminder as we frantically check to see who won gold for the gymnastics floor exercise. As a country’s athletic prowess is brought to the international stage, one can only reflect upon the importance of sport within our daily lives. While nations are often associated with various sports, and even more specifically with the winter or summer seasons, categories aside, fans of any sport often go through the same emotional highs and lows when rooting on for their favorite team, or even the underdog. 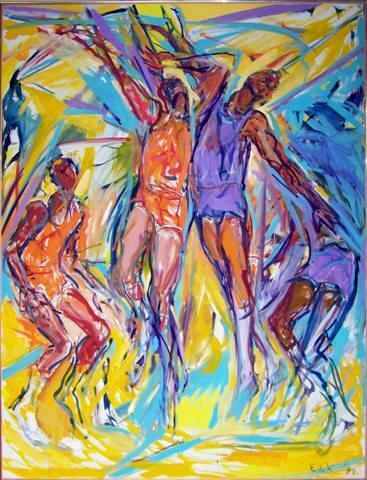 Elaine de Kooning, Basketball No. 40, 1977, Oil on canvas, Levis Fine Art. Click to inquire. 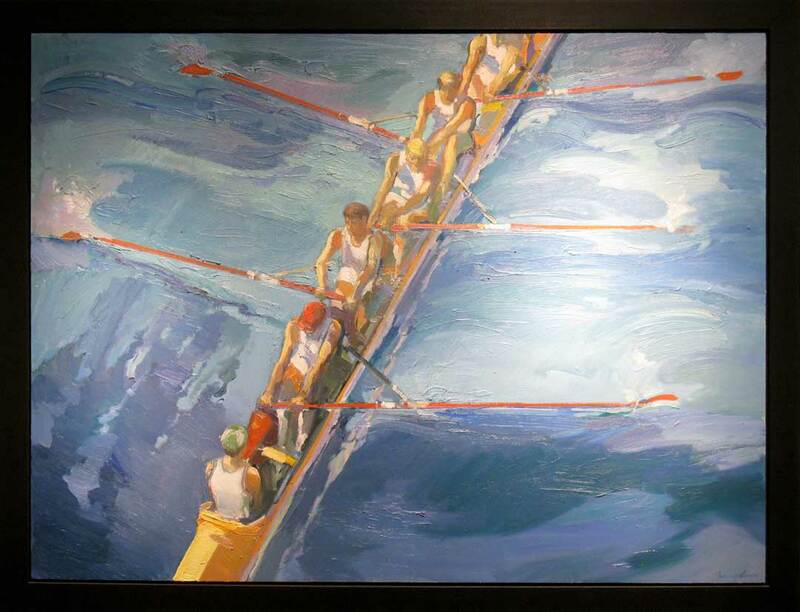 Francis Livingston, The Rowers, Oil on panel, Arcadia Contemporary. Click to inquire. The universality of cheering and the neutrality of athletics offers some sense of peace within the world. Watching sports often conjures emotions-visceral feelings of elation, anxiety and disappointment. Thus, how do visual depictions of sporting events successfully incite a spectator’s excitement. Perhaps the more difficult task for the artist is instead rendering the champion…or the defeated. Through artistic mediums, athletes become magically elegant subject matters: with the power of art greatly elevating their arduous journey as they are in the throes of competition. 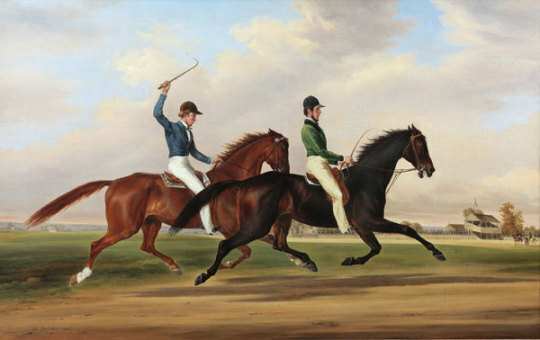 Henri DeLattre, The Race Between Mac and Zachary Taylor at Hunting Park Course, Philadelphia, July 18, 1849, Oil on canvas, Red Fox Fine Art. Click to inquire. 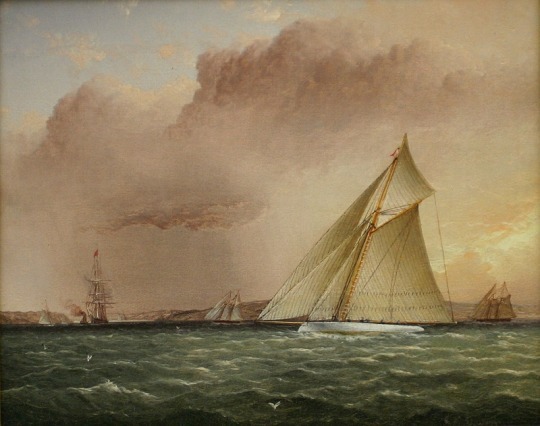 James E. Buttersworth, PURITAN Races Towards The Narrows Off Brooklyn - American Yachts Off New York, Oil on board, Vallejo Gallery. Click to inquire.